A cobalt blue electric harp startles the eye. Sophisticated melodies dance around time and rhythm. The music moves from Latin to the blues, the ache of a song to the unabashed joy of a tune. It’s not the kind of harping that people expect, but the unexpected is exactly what Amelia Romano delivers on her aptly-titled debut album, New Perspectives (released March 17, 2017). Instead, there’s an honest and powerful energy to Amelia Romano’s music, the sheer joy of exploring the instruments limitless possibilities is at the core of her work. 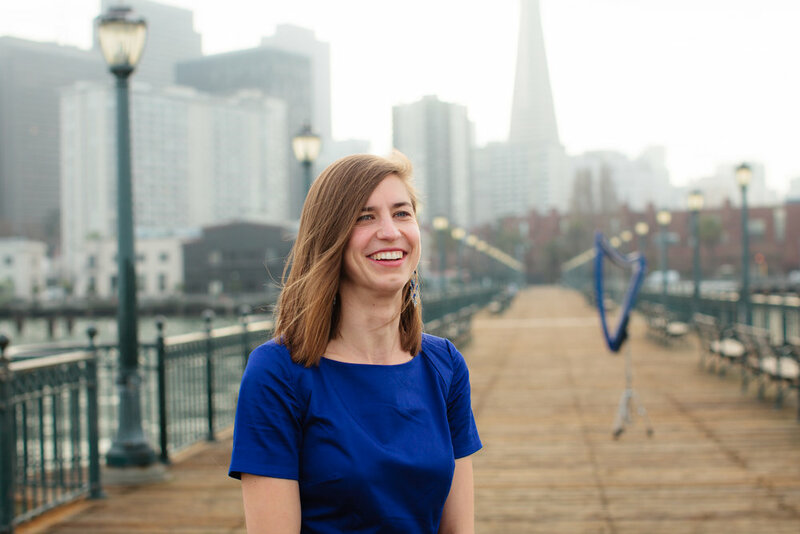 But the native San Franciscan has been in love with the instrument since she first heard it at a school assembly in third grade. From the beginning of her studies, Romano was exposed to world music. She quickly fell in love with the music of Latin America. “I love finding rhythms beyond the expected,” Romano says. “And Latin music does that. There’s a big tradition of harp music all across Latin America. What’s interesting is that there, it’s a man’s instrument." With pieces like “Joroportiz,” Romano honors that long tradition. But one of the albums biggest surprises is her version of the standard “Besame Mucho.” She scrapes the cheese off a weary song and remakes it into a sparkling piece that brings out the innate romance that lives there. "It’s the most-recorded song in Mexico. The melody is quite simple and I saw ways to refresh it. So there’s a tango bass line played on harp, a string section, and improvisation built between the romantic narrative."" Romano’s time in South Africa was also the catalyst for her own songwriting, beginning with "Salutations,” her first compositions with lyrics commemorating an important relationship that deeply shaped her time in Cape Town. “I studied in Cape Town as part of my degree at U.C. Berkeley. During my stay I volunteered at the Ntonga Music School.When I returned to the United States, I applied to the Playing for Change Foundation to support my return. It was a remarkable experience, but I was in over my head, and the legacy of apartheid is complex and will change more slowly than I understood at the time. Upon my return in 2011, I began writing songs– “Salutations” was just the first. "Receiver" describes my experience calling Cape Town once back in the United States, while "Crazy Day" was first written as a collaboration with an Afrikaans musician, and roommate, from South Africa." And the scope of the album itself came about more by serendipitous accident than design. "It was quite unplanned,” Romano admits, but it was built on my South African experience and the relationships I formed with musicians since my return. There is a cellist and percussionist from my trio, StringQuake, three different guitarists, a flautist, and the sax I knew I could hear in my mind for ‘I’d Rather Go Blind.’ I started with several solo harp compositions and a few arranged tunes. Fifteen months later, I had collaborated with over a dozen musicians to compile a 14 track album. 'Defying Gravity' found its way on by chance and track 15 was an accidental jam captured live." "'NEW PERSPECTIVES': A GIRL, A HARP AND DEFIED EXPECTATIONS"
The blue harp is jarring. It punctuates the cityscape of San Francisco, refusing to blend in with the clear sky above. Just as out of place as the azure harp are the melodies emanating from it. We’ve seen this instrument before, in orchestral halls and mythological tales, but the music Amelia Romano’s harp creates is hardly classical nor folkloric. Gazing upon the skyline captured in Romano’s “Legacy” video, one of the singles off her album New Perspectives, one begins to understand the tapestry of influences that compose the work. In this city, cultures and worlds collide, yet a humble cohesiveness emerges from such disparity. Although seemingly grounded in San Francisco, the compositions on New Perspectives took shape far from home, in Gugulethu Township outside Cape Town, where Romano spent a year teaching harp at a township music school. The album blossoms from this outsider perspective, this feeling of un-belonging. “Crazy Day” recalls a particularly trying moment when Romano returns to her home in the suburbs to find her car stolen. The urgency in the intricate melodies seem to mirror the intensity of Romano’s feelings. Yet the song goes on, as it must, and the confusion paves way for order. We are lost in the twists and turns of the piece, yet continuously guided onward by an underlying unity within the rhythmic themes. While New Perspectives is rooted in Romano’s South African experiences and the collective musical history of the country, the story does not end there. Romano wrote, arranged, and recorded the bulk of the album’s songs from her perch in San Francisco’s Mission District. Romano never strays from this space, which is evident both in the stories that underlie her songs and in the compositions themselves. The diverse talents of her collaborators throw greater dissonance into the mix, and the album is undoubtedly stronger for it. From the ashes of this culture clash, of tales of understanding and misunderstanding, New Perspectives takes root in a rich soil. It defies expectations, and therein lies its power to transcend the individual. You've never heard harp sound this way, yet the songs on New Perspectives feel comfortable, like hearing a song on the radio that you can’t quite place but remember nonetheless. Upon listening to New Perspectives, one ceases to feel like an outsider and becomes enmeshed in a fabric of melodies, cultures, and histories. We are stronger for the many strings that compose our existences, a credo exhibited so masterfully by the girl and her blue harp. In these uncertain times, when difference is decried and diversity punished, New Perspectives feels more essential than ever. Michelle Robertson: What was your goal with this album? Amelia Romano: I want listeners to see the harp in a different light. It’s not classical, not folk music; it’s a lot of different things and remains open to interpretation. MR: How did your time in Cape Town influence the album’s sound? AR: I’ve always loved interesting rhythms and listening to all the styles present in Cape Town, and I just took them in, digested them. From here, this dichotomy of melody and rhythm took on a new form. MR: How is this different from your previous work? AR: I’ve only made one other solo/collaborative album, when I was in high school, and it honored the folk harp. This album is a new stage for me, it’s a coming out. MR: You really put harp into a new category with New Perspectives. It’s an instrument we all recognize, yet it’s so untouchable at the same time. AR: At shows, people will often tell me that they’ve never been so close to a harp. I’m hoping this breaks down stereotypes and mental barriers. MR: You spent a year in Cape Town, teaching harp at a township. Why harp? AR: Many of the kids had never seen an orchestral instrument let alone a lap harp (harpsicle) before, but quickly the novelty became the norm. From not knowing what the instrument was to seeing them interact with it, connect with it. That was pure joy. MR: How did your expectations for your experience change once you got to Cape Town? AR: I had an idea of what I wanted to do, which was to create a harp ensemble. I soon realized that music class was going to be much more than performances and practice. The school and harp ensemble were a safe haven for the kids. They felt a sense of belonging, purpose. Many realized they could excel on the harp even if academics didn’t come easily. MR: What are some of the challenges you faced? AR: Living between two worlds, the city and township, was a big one, as was the language barrier. The economic divide was heartbreaking, but I internalized the experience and channeled it to make art. MR: Did not knowing the language give you a new understanding of the power of words? AR: Yes. “Salutations” was the first song I wrote with lyrics. I was ready to share a new layer of vulnerability, putting a melody to lyrics and a personal experience to words. MR: What are some of the things you had to get used to while in Cape Town? AR: Everything is so much more spontaneous there, in the moment. Joy, struggle, spontaneity coexist beside each other. MR: How does this influence the music? AR: I remember going to the bars and witnessing locals with a few drinks come alive at the mic. People are not afraid to be themselves. There is a sense of “what do I have to lose?” You feel this in every element of their artistic lives. They sing their heart out, inviting visitors to open to the pain and joy that they translate into their creative juice. MR: Art transcends time and place. AR: And that’s important to remember in this day and age. MR: Was it difficult to come back to San Francisco? AR: Coming home and re-entering a world where people know you but don’t know what you’ve experienced was very difficult. MR: There are many collaborators on New Perspectives. AR: This album really speaks to the artistic relationships I’ve built since returning to San Francisco. Collaboration is vulnerable, but I wanted my friends to be a part of the album. It was a new element to the musical journey, detaching from the initial emotions that inspired many works to join a larger voice. MR: What do you hope listeners take away from the album? AR: I made it based on what I find interesting; making music is very subjective after all. I’m hoping to create a conversation with the listener that, as the album name implies, gives the opportunity to create a new perspective on the instrument while giving a taste of my artistic journey. Harp can be anything you want it to be – rock, Latin, classical. MR: A blue harp helps break down those preconceptions instantly. AR: Before listeners even hear a note, they’ve started to think about the instrument differently.